Did you know that I have a strange love for teen shows? I was a dedicated One Tree Hill fan until the end, even as awful as the show was at times. But a show that I’m ridiculously excited to start back up this season… Vampire Diaries. Seriously. I can’t help it. I mean there’s Damon and Stefan and some other people rounding out the bunch who don’t really matter quite as much. I know you agree. Well, today my fellow teen show loving friend is joining us. Brandy of Nutmeg Nanny is sharing a perfect snack to enjoy as an after school treat or maybe for premiere night. This is going to be a loooonng month of waiting! Hello Baked by Rachel readers! I’m Brandy and I blog over at Nutmeg Nanny. 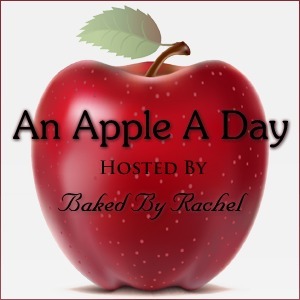 When Rachel asked me to be part of her apple party I couldn’t resist. I love apples and my kitchen is overflowing with them at the moment. 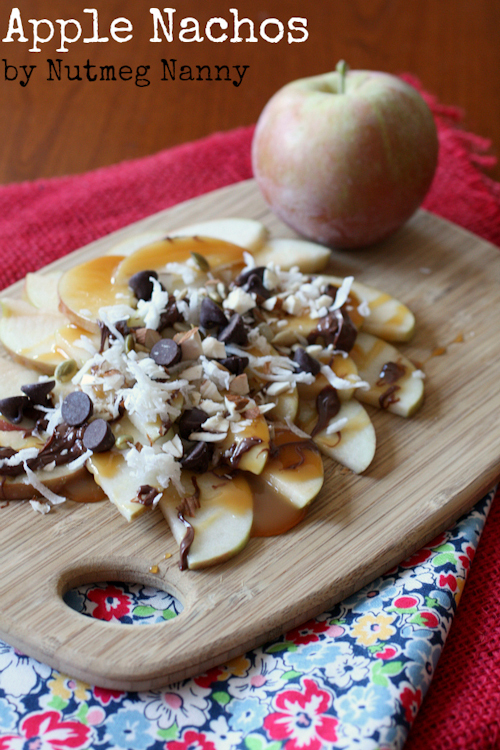 It took me forever to figure out what I wanted to make but I finally settled on these apple nachos. They are fully loaded but not nearly as bad for you as real nachos. 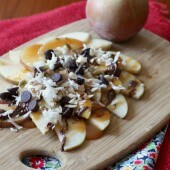 I simply drizzled on a little caramel and nutella and then sprinkled on some almonds, chocolate chips and coconut. It was the perfect sweet and crunchy combination! Slice apples thinly and put a little lemon juice on the slices to keep them from browning. Arrange the apple slices on a platter. 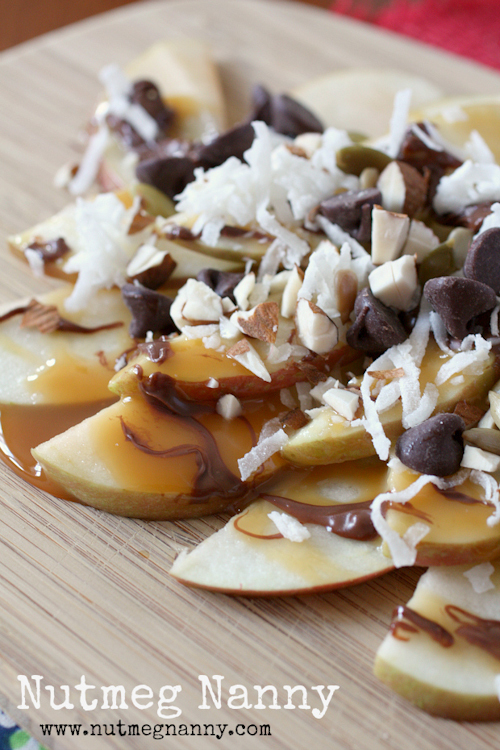 Gently warm caramel and nutella and drizzle on top of the apple slices. Sprinkle the remaining toppings and enjoy! This recipe is best served when eaten right away. You can find Brandy on Facebook, Twitter and Pinterest. Check out some more of Brandy’s recipes: Chewy chocolate chip cookies, Mulled cider and Spicy Thai pumpkin soup.